Front-Door Key (written as Front Door Key for the PAL version), or E-1, is the first mission of the Treacherous Mansion in Luigi's Mansion: Dark Moon. Professor E. Gadd tells Luigi that the final Dark Moon piece appears to be located in the Treacherous Mansion and that the Parascope is picking up the highest levels of paranormal activity ever recorded. He tells Luigi that even going near the mansion would be a terrible idea, but manages to persuade him to go by telling him that he's the only one that can recover the last Dark Moon piece. Professor E. Gadd proceeds to give Luigi the door key to the Front Entrance of the Treacherous Mansion. He explains to Luigi that he tried to pinpoint the Dark Moon piece in the mansion, but there's too much paranormal interference to locate it. He wishes Luigi luck in finding it and activates the pixelator, sending Luigi to the Veranda. After being pixelated, Luigi lands on two feet and proceeds to open the large gate in front of him, revealing the Treacherous Mansion to him. Luigi gazes at the mansion and the strong wind currents blow his hat off his head, but he manages to catch it before it falls into the ravine below him, nearly falling in himself. He puts his hat back on and starts crossing the narrow cliffs in front of him, which collapse behind him when he reaches the other side. Luigi proceeds to open the front door to the mansion, but the Polterpup bursts through the doors, knocking Luigi back onto the ground causing him to drop the key. The Polterpup eats the key and runs off. Luigi peers into the window to the right of the door to see King Boo trapping a purple Toad in a painting and two Boos taking a toad painting away. Luigi continues to track down the Polterpup, travelling to the Bottom of Well and through to the Guard Tunnel, where he sees the Polterpup run through a collapsed passageway into the Ceremonial Chamber. Before he can continue, Luigi gets attacked by three Strong Greenies and a Strong Slammer. Luigi proceeds past the Cliffside to the Ceremonial Chamber where he sees the Polterpup struggle through the floor. Luigi lights three torches around the room which causes a throne with a suit of armor sitting on it to rise in the back of the room. As Luigi approaches it, another suit of armour attacks Luigi. Luigi trips up the suit of armor by pulling out a rug from underneath it, revealing it to be just a Strong Greenie possessing it. After Luigi has caught the two Strong Greenies in this room, he sits on the throne in the back, which then lowers into the Haunted Catacombs. Luigi manages to find his way through the Haunted Catacombs by tracking the Polterpup's pawprints with the Dark-Light Device. When he enters the Underground Lab, he sees two Strong Greenies playing with a machine zapping a suit of armor. He captures these two and a Strong Sneaker to continue and also zaps the suit of armor himself to find and capture a Boo. Luigi then finds his way through the Haunted Catacombs again to get to the Dungeon Cells where he finds the Polterpup. When the Polterpup notices Luigi, he runs to the other side of the room as Luigi has to capture a Strong Hider. After he captures the Strong Hider, he proceeds to flip a portion of one of the walls which has a painting of a bomb on it. He uses the Dark-Light through the bars to release a bomb from the painting which collapses part of another wall. He uses this hole to get to the barrel that the Polterpup is hiding in, and captures the Polterpup, retrieving the front door key. Professor E. Gadd pixelates Luigi back to the Bunker and explains to Luigi that he made special adjustments to the Vault so the Polterpup wouldn't escape from it this time. He then proceeds to hack into the Pixelator by the front door of the Treacherous Mansion as the old one can't be used because the pathway to the mansion collapsed. 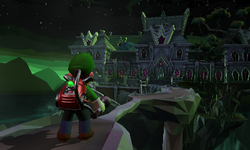 He will also suggest Luigi to train in the ScareScraper to sharpen his skills to make it through the mansion. Use the Front-Door Key to open the Front Entrance of the Treacherous Mansion. Once inside, start looking for the Dark Moon piece. Follow the Polterpup, and recover the Front-Door Key. In the Underground Lab, Luigi vacuums the valve at the back of the room all the way so lightning strikes the suit of armor and the helmet blasts off, forcing out the Boo. The paranormal activity in this mansion is completely off the charts! Stay on your toes, and start looking for the Dark Moon piece. The scene where two Strong Greenies bring the suit of armor to life with electricity is a reference to the film version of Frankenstein. This page was last edited on February 27, 2019, at 23:06.